If you're looking for purpose designed wine storage, the HUS-ZY3-D-NS-26 Signature Wine Cooler is made just for wine lovers at home. This compact 38.0cm wide model is ideal for restricted spaces and is suitable for built in or free standing use, yet its slide out wooden shelves still swallow up to 26 x 75cl bottles and chills them to perfection. At 87.5cm high, it slots under any kitchen worktop and also looks great in the dining room. Touch screen digital controls allow wine enthusiasts to chill different wines at two totally different temperatures, all monitored by dual LED displays. The upper zone cools up to 15 bottles at any preferred temperature between 5-12°C, whilst the lower zone will store 11 bottles between 12-22°C. The elegant glass door with black outline and aluminium trim contains features normally only seen in high-end wine cabinets. These include UV-safe glass to help protect your wine collection, subtle interior lighting and a replaceable carbon filter to protect your wine from bad odours. 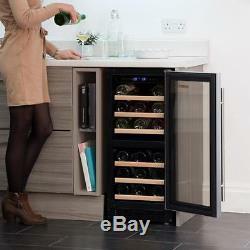 Help protect you wine collection from harmful sunrays. Doors are lockable for extra protection. Replaceable charcoal filter protects contents from damaging odours. 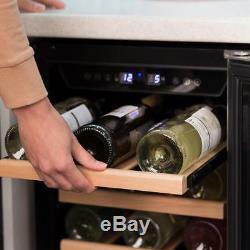 Easy access slide-out wooden shelves to place you wine collection. H 87.5 x W 38.0 x D 60.0 cm. We go above and beyond to ensure you receive the best level of service. The item "Home Bottle Signature Dual Zone DRINKS FRIDGES Wine Cooler Aluminium Trim Glass" is in sale since Saturday, October 21, 2017. 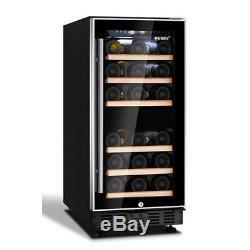 This item is in the category "Home, Furniture & DIY\Appliances\Fridges & Freezers\Wine Cabinets/Fridges".marketplace" and is located in London. This item can be shipped to United Kingdom.